In the early Middle Ages Norway was comprised of many petty kingships. According to the sagas, it was Harald Fairhair (ca. 865  ca. 933) who united Norway into a single kingdom. Harald Fairhairs father, Halfdan the Black, was a petty king in the regions of Vestfold and Oppland. 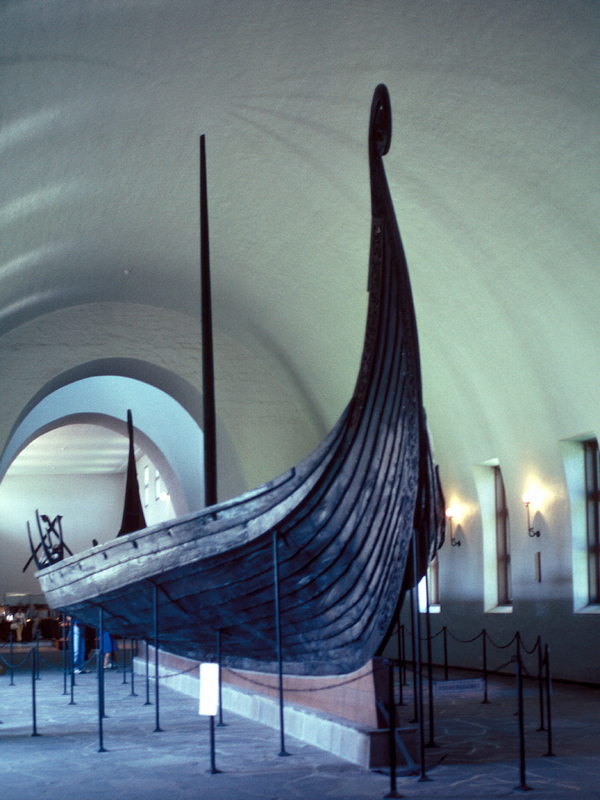 Legend has it that Harald was only ten years old when he acceded to his fathers kingship, after Halfdan the Black fell through the ice on Randsfjorden and drowned. Harald was an ambitious king, however, and he set out to unite all the petty kingships into a single realm. According to Snorre Sturlason, the Icelandic saga-writer and historian, Harald swore that he would not cut his hair until he had achieved his goal – thus, the origin of his name. The Battle of Hafrsfjord, presumed to have taken place in about 885, is regarded as a critical battle in the process of unifying Norway. However, although the country became united under a single king in principle, it would be years before a permanent, stable governing structure was in place. The Leidang was to be one element in this structure. The Leidang was a shared, planned defensive coastal fleet comprised of local vessels. It was initiated by Harald Fairhairs son, Haakon I, known as Haakon The Good (ca. 920-960). The population along the coast was obliged to provide ships, manpower and provisions. Over time the duty to contribute resources to the Leidang evolved into an ordinary tax paid to the king. The Christianisation of Norway played a crucial role in the unification of the kingdom. The Christianisation was a long process, but Olav II Haraldsson (995-1030) established Christianity as the kingdoms only lawful religion, and the Battle of Stiklestad in 1030 is viewed as the key event. Although King Olav was killed in battle, the kingdom-wide church establishment that emerged helped to consolidate the kingdom. Following his death, King Olav was canonised. Olav the Holy became a national symbol, and his status as saint also gave legitimacy to his descendants and their claim to the throne. Throughout the 12th century the church strengthened its power by establishing permanent sees and several monasteries. The coronation of the child king Magnus Erlingson in 1163 was the first in Norway, and this event reinforced the central position of the church. The young kings right to the throne came only through his mother, and was contested by Sverre Sigurdsson. King Magnus used the churchs blessing to bolster his claim to the throne. In the Middle Ages the Kingdom of Norway was a hereditary electoral monarchy – in other words, the monarchy was based on a combination of inheritance and electoral consent. All the kings sons, legitimate and illegitimate alike, inherited an equal right to the throne and could bring their claim before the assembly. Those present at the assembly would decide whether to elect the son who sought the throne. Acceptance by the assembly – the peoples consent – gave legitimacy to the authority of the king. The Law of Royal Succession of 1163 simplified succession and strengthened the power of the crown by replacing the system of hereditary electoral monarchy with primogeniture, in which only the eldest legitimate son inherited the right to the throne. A new Law of Royal Succession enacted in 1260 reconfirmed that the monarchy in Norway was purely hereditary, and that the crown was to be passed on from father to eldest son. Haakon V Magnusson died in 1319 without a male heir. His daughter, Ingeborg, was married to the Swedish crown prince Erik. Their son, Magnus, thus became the heir to both the Norwegian and Swedish thrones. This was the first of many personal unions between Norway, Sweden and Denmark. Norways political and economic power declined during the 14th century, due in part to the ravages of the Black Death. The kingdom became increasingly less important as a partner in its unions. In 1536 Norway was proclaimed a Danish dependency, and ceased to be an independent kingdom altogether.